Carnegie Council’s “The Living Legacy of the First World War” fellowship project is exploring aspects of the U.S. experience in WWI in the months leading up to Armistice Day 2018; activities include a new weekly podcast series, with project leader Senior Fellow Col. Reed Bonadonna interviewing each of the 9 fellows. One hundred years after what H.G. Wells called a war to end wars, war and its costs and consequences are still very much with us, and the need for compassion and principled engagement is just as great. 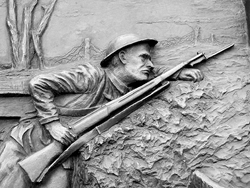 Carnegie Council’s "The Living Legacy of the First World War" is a fellowship project that explores various aspects of the American experience in WWI. Launched in June 2017, the centennial of America’s entry into the war, the nine non-resident fellows are conducting original research in the months leading up to Armistice Day, 2018. Led by Carnegie Council Senior Fellow Colonel Reed Bonadonna,(Ret.) the project is supported by a grant from the Richard Lounsbery Foundation. As part of this initiative, Col. Bonadonna has created a series of weekly podcast interviews with each of the fellows, which starts airing on Tuesday, April 3. The interviews will also be available on the Carnegie Council website https://www.carnegiecouncil.org/, with full transcripts. "The fellows' research topics include airpower and international law, defense contracting, censorship, post-traumatic stress, and the humanitarianism of Jane Addams," said Col. Bonadonna. "This list gives some idea of the influence and relevance of the First World War in our own time. One hundred years after what H.G. Wells called a war to end wars, war and its costs and consequences are still very much with us, and the need for compassion and principled engagement is just as great." The Richard Lounsbery Foundation aims to enhance national strengths in science and technology through support of a variety of programs in research, education, and public policy. Among its international initiatives, the Foundation has a long-standing priority in Franco-American relations, as Richard Lounsbery was a U.S. Army officer who served in France during World War I. For more, go to https://www.rlounsbery.org/.